If you want something different from your anime, something other than the usual clichés about giant robots, girls with guns, hapless teenaged boys surrounded by a harem of lovelies, in other words something unique, then you could do worse then look up the work of Yoshitoshi ABe. I first noticed his work with the mind-bending Serial Experiments Lain. This journey into a young girl`s mind as she explored the net and found another plane of existence was by turns confusing, chilling, and inspiring. Surreal visuals combined with a complex narrative that invites repeated viewing. Next was the dystopian vision of Texhnolyze, with a prizefighter`s existence in a literal underworld in the midst of a three-way battle for supremacy revealing a dark and foreboding vision of humanity. And with Haibane-Renmei, his attention turns to… angels? 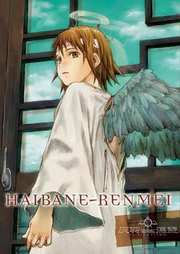 The Haibane are indeed angelic in appearance. They are reborn, with no memory of their previous lives into a mysteriously structured society, and they do indeed have wings and haloes. 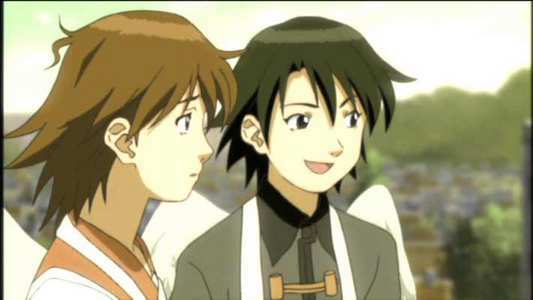 Their haloes are provided by the Haibane-Renmei, a group that regulates all aspects of their existence, and they live side by side with humans in an isolated town, trading work for goods. We explore this world through the eyes of Rakka, the newest addition to the community of Haibane, in this first volume of four presented by MVM that contains four episodes. The Haibane find a cocoon in a rarely visited corner of their home, and realise that a new member will soon be joining them. Sure enough, the cocoon hatches to reveal a young girl, who like them all has no memory of her past life. Like all of the Haibane, she receives a name related to the dream she had before her birth, in this case Rakka. The oldest of the Haibane, Reki tells her about her new life, and she nurses her through the difficult night as her wings sprout. Rakka is taken on a tour of her new home, and learns more about what it means to be Haibane. 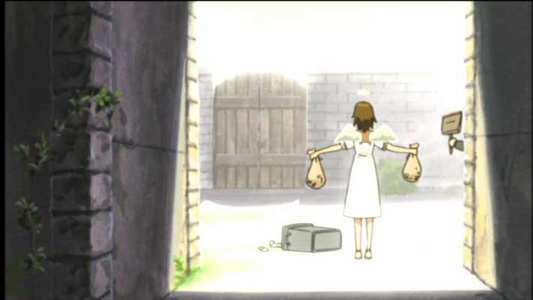 She`s surprised to see that only Haibane have wings, and that they live side by side with a human community. Yet this is no ordinary community, walled off from the outside world and with no one permitted to leave. 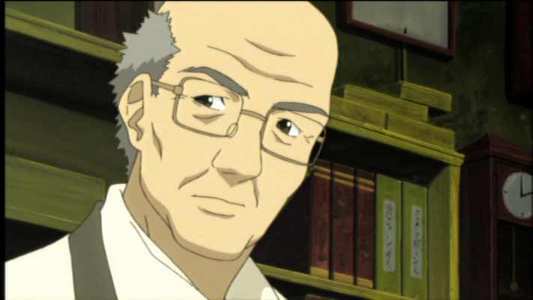 Haibane are forbidden from earning money, and must exchange services for goods. They are only allowed to wear old clothes, and everything regarding their existence is governed by the Haibane-Renmei. Which is when Rakka receives an invitation from the Haibane-Renmei to visit their temple. Hikari and Rakka visit the temple, so that Hikari can return the halo mould, while Rakka is formally accepted as a Haibane. This means it`s time for Rakka to find a way that she can contribute to the community. She starts by shadowing all the other Haibane to see what they do, and if she has any aptitude for it. Hikari works at the town bakery, and Rakka learns that she is quite the innovator, having been inspired by her halo to create a new snack food. Rakka joins Kana to see what she does for a living. Kana is quite technically skilled, and works at the town`s clock tower to restore its workings. Her ambition is to restore the clock in Old Home, but first she must serve her apprenticeship. It`s a curious relationship she has with the watchmaker, as Rakka learns. Haibane-Renmei gets a 1.78:1 anamorphic transfer. It`s clear if a little soft, and the transfer is prone to the occasional compression artefacts and aliasing, the former most often during scene transitions. The animation is lush with a suitably ethereal feel to it, the palette consists mostly of pastels, and the use of light is delicately but effectively done. The CGI blends well with the 2D animation, and it`s hard to spot the seams. You get a choice between DD 2.0 English and Japanese, accompanied by translated English subtitles or signs. Everything is clear and in order for both dialogue tracks. The incidental music suits the story well, and the theme songs are really quite special. You get a brief selection of extras, including the Creditless Opening, Original Japanese Opening, and art gallery with 20 images, the episode previews and the usual MVM trailers, in this case for Chobits and Trigun. From the Internet, via a dystopian future underworld to a community of angels, Yoshitoshi ABe`s output is nothing if not diverse. But all these series have something in common; they present an imaginative reality at face value, and then gradually over the series peel back the layers of mystery behind it. They are cerebral, considered experiences and that is just as true for Haibane-Renmei, with its uniquely isolated community of humans and Haibane, living strictly organised lives. However, it is apparent at first glance that unlike the other series, Haibane-Renmei is instantly accessible by a broad audience. That`s simply because it is filled with likeable characters, living charmingly domestic lives with ethereal overtones. From the moment that Rakka is born into this world, the main flow of the story concerns her learning how to live in the community. We get to see the fundamentals of the Haibane straight away, the wings and the haloes, but the rest of the time is devoted to her fitting in and finding her place. Simple things like finding clothes to wear, getting to know the village and her new home, as well as finding a role for herself in this society take up much of the time, but as this world is so different, it`s fun to explore it with her. It helps that the character interactions are light and playful, and there are plenty of charming moments that will bring a smile to the face. Balanced against this is the mystery of the Haibane, and as usual for a Yoshitoshi ABe animation, there are more questions than answers at this point. 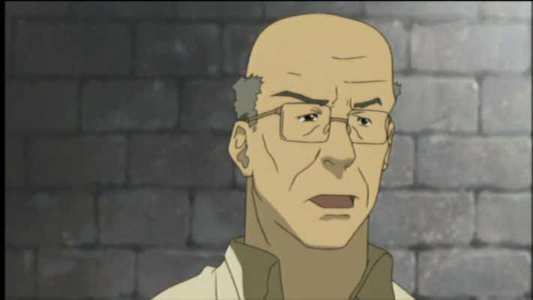 Just why is the village walled in, it`s population isolated, who are the Haibane-Renmei that govern the interaction between both groups? Of course there are the Haibane themselves. Who are these strange creatures? Why don`t they have memories of their past lives? What is their role in this society? And then on personal levels there is a dark hidden side to Reki contributing to her pensive outlook, and Rakka is struck by visions of crows, especially related to her first dream. It`s an absolutely tantalising prospect just to explore this world. The magical realm of Haibane-Renmei is another compelling one from the pen and brush of Yoshitoshi Abe, but this one is sweet, tender and immersive, and you`ll be hard pressed not to smile your way through these gentle and touching episodes. It`s an easy one to recommend, and deserves to be seen.